Are you tired of aching sore ankles that hurt just walking? Have you given up sports because you can't bear the pain? Have you ever suffered from an ankle sprain, even years ago? Are you frustrated with chronic pain and no solution in sight? Ankle Sprain Solutions is the answer to treating your ankle pain. My name is Bart Anderson and I am a certified athletic trainer. I have treated countless people like you with ankle sprains - from grade III sprains that eventually required surgery, to minor sprains that are back to normal in a few weeks. In the last 10 years of practice I have learned that ankle sprains can't be under estimated. I have treated too many people, just like you, who suffered an ankle sprain weeks, months, or years ago, and they still have pain. They followed their doctors advice of rest and ice, but they never seemed to get better. Every one of these patients got better - most of them returned to sports. This isn't just another rest, ice, compression, and elevation program.You received that information from the emergency room, your doctor, or the internet - yet you still have pain weeks or months later. Don't get me wrong - R.I.C.E. is essential for treating actue ankle sprains, but where most treatment programs stop, Ankle Sprain Solutions shows you what to do after the rest and ice to eliminate your pain for good. Even if your ankle sprain occured months or years ago, it is never too late to start rehabilitation. In fact, you likely will continue to have pain and problems until you do. When you sprained your ankle, there was damage to the ligaments within the ankle. These ligaments heal with time and rest. But the communication between the ligaments and the muscles won't be restored. Communication between the ligaments and muscles, what is called proprioception, is the essential link to your ankle functioning normally. The only way to restore that communication is with rehabilitation. Ankle Sprain solutions is a complete program that will walk you step by step through over 30 exercises proven to eliminate your ankle pain and get you back to normal. It contains all of the best exercises for restoring your normal range of motion, decreasing swelling, reducing pain, improving your strength, balance, and endurance. The program is broken down into easy to follow stages, and each stage builds upon the previous as your ankle continues to heal and get stronger. Advanced exercises to return to to sports, including running, jumping, and hopping drills will get you back to sports in just weeks.These are the same exercises and progressions that I use with my own patients, so I know they work. The entire program requires very little equipment, so you don't have to make any huge investments or buy a gym membership. That also means you can do it all in the comfort of your own home, saving time and gas driving to a rehabilitation clinic or gym. Best of all, ankle sprain solutions will free you from chronic ankle pain and give you the freedom to do the things you love. Think about how long you have suffered from your ankle pain. Isn't it time to finally get to the bottom of the problem and find a solution - one that doesn't involve medications, injections, or surgery? I developed Ankle Sprain Solutions for anyone suffering from ankle pain. I have seen too many people, like you, who just didn't get the right guidance after their ankle sprain, and now live with pain. If you suffer chronic ankle sprains, this is your key to stopping your sprains. If you are considering surgery, this could be your key to avoiding it. If you have ever suffered from an ankle sprain and continue to have pain today - weeks, months, or years after your injury - this program is for you. It is time to put an end to your frustration and pain. No one should go through life avoiding the things they enjoy. You shouln't be sidelined from your favorite sports or recreational activities. You can be pain free in a matter of weeks, all you need is the right program and a little guidance. Think about how much time you have already spent living with your ankle pain. Now it is time to start your recovery. Advanced exercises that will make you stronger and faster than before your injury. Thats right. I am positive that Ankle Sprain Solutions will help reduce or eliminate your ankle pain. So positive that I will gladly refund your entire purchase price at any time within the next year if you are not completely satisfied with your purchase. Absolutely no questions asked. With your purchase of ankle sprain solutions you will also receive one on one customer support - so if you have specific questions about the ebook or don't quite understand an exercise, I am only an email away. Where else can you get a complete program of exercises proven to eliminate ankle pain for less than $15? This will open your shopping cart with Ankle Sprain Solutions. If you have a discount code, you can enter that in the appropriate box. Click on the yellow PayPal button to check out. You will be taken to a secure payment page and will be able to complete your order. 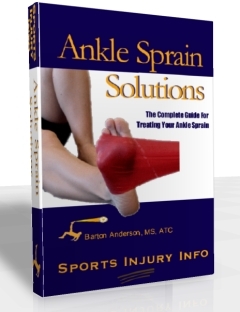 Ankle Sprain Solutions is only available as a downloadable ebook. No physical product will be shipped to you. If you have any problems at all with your download, with your payment, or with your emails, please let me know.Use the contact form on the site. Make sure you include your contact information and the email address you used when you ordered. You don't have to live with ankle pain. 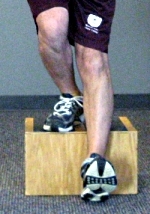 It doesn't matter how long ago your ankle sprain was - it is never too late to start rehabilitation. Haven't you lived with your pain for long enough? This could be the solution you have been searching for - the only way to know for sure is to give it a try. You have nothing to lose but time. Go ahead, download your copy today - try the exercises, work through the program. If, after you give the program a chance, you are not completely satisfied, send me an email, or use the contact form, and I will gladly refund your entire purchase price - with absolutely no questions asked. I developed this program to help people like you eliminate their ankle pain and frustration. But you cannot benefit from the program unless you try it. How much is a pain free ankle worth to you? Download Your Ankle Sprain Solutions Today!